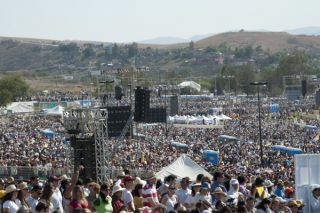 At Bicentennial Park near Silao, Mexico, a sun-drenched, open-air Mass celebrated by Pope Benedict the XVI gathered a sizable crowd that the Associated Press estimated to reach 350,000 people. To ensure everybody could hear words and music clearly and to full effect, more than 375 Meyer Sound loudspeakers converged at the site—including 268 MILO® line array loudspeakers, likely the most ever deployed for any single event. The daunting challenge of audio system design was shouldered by Rodrigo López of Mexico City-based consulting firm Zero Phase. His assignment was to provide uniform coverage across a vast, irregularly-shaped area—over a kilometer wide and a half kilometer deep—comprising uneven hillsides, sloped parking lots and open fields. To augment the main stage MILO arrays, López plotted a system of 40 delay towers laid out along 12 delay lines. Arrays on most towers were configured with five to eight MILO loudspeakers, with some delay lines deploying contingents of 30 M3D and 32 MICA® line array loudspeakers. The Meyer Sound roster also included 32 700-HP subwoofers, ten UPA-1P loudspeakers for stage foldback and various fills, six MSL-4 loudspeakers for in-fill, and a Galileo® loudspeaker management system encompassing 24 Galileo 616 processors. Three SIM® 3 audio analyzers were used for system tuning. The event was mixed on DiGiCo SD7 and SD10 consoles.